The county of Henderson was created by an act of legislature effective January 1, 1841. Oquawka has been the county seat since that time. The 4 large, white columns and south portion of the building we see today are that of the original structure. 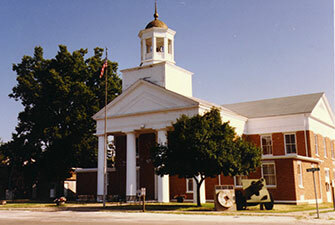 It is the second oldest court house in Illinois still in continuous use. Judge Stephen Douglas held the first court in Oquawka. 1993 was the 150th anniversary of the completion and dedication of the grand old Court House. The Court House was honored and commemorated with a special gala event during the 1993 Heritage Trail Days Festival always held the last full weekend of September. The mighty Mississippi still flows past our historical town of Oquawka, almost the same as in the days of 1827 when a Dr. Isaac Galland staked his claim to this sandy shoreline of the, so called, Military Tract.